Is there anything so sweet and tasty as a freshly picked garden tomato? I think not. This year I planted one tomato plant along the new fence. It was nestled between two climbing rose bushes. Plenty room for branches and vines. Every day I watched the tomato plant grow, watered it often during the really hot and dry days and kept the boys from tramping on it. Finally one green tomato appeared. Then a few more. I watched the first one grow carefully, changing in color from green to orange then red. The prefect time to pick it depends on making sure it has achieved maximum on-vine sweetness and before any bugs get to it first. Not an easy balance in this pesticide free garden. Each day I watched as the color intensified. Then there it was, the perfect day. Warm, sweet, juicy and delicious. The perfect food on a summer day. 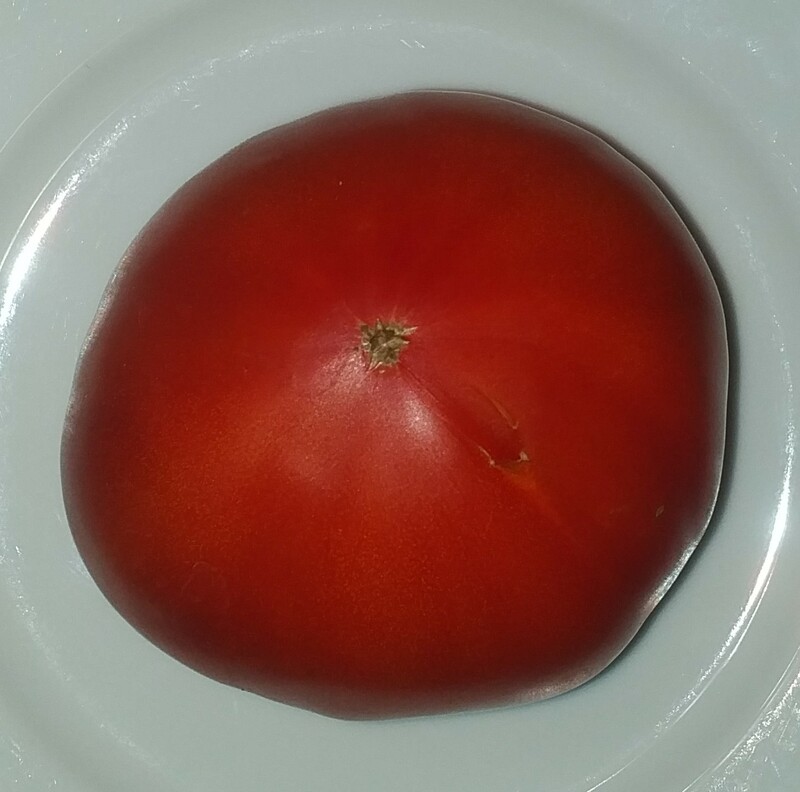 A perfectly vine ripened tomato. So delicious. 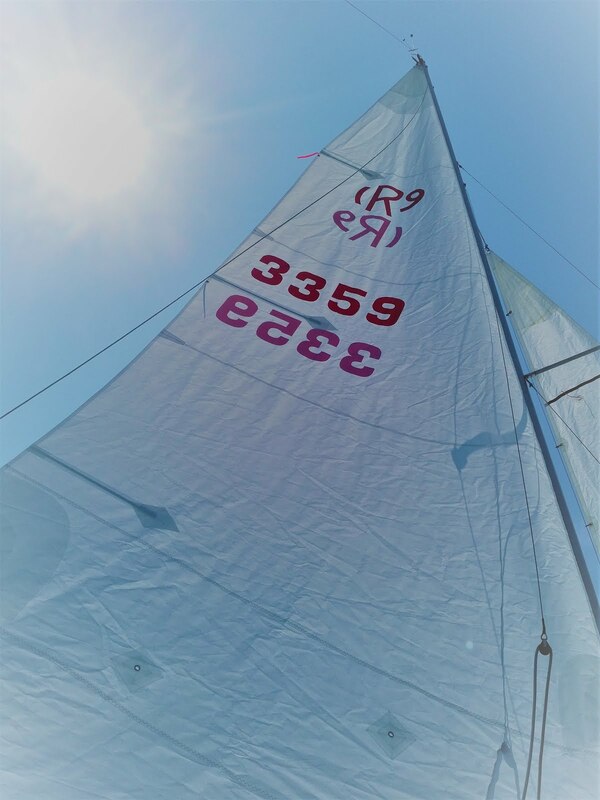 Yes, it is not only sailing season here in New England but it is also racing season. This Sunday was the annual one design race for the Stars and Rhodes 19 sailboats. The weather was perfect, a nice breeze and no challenge from the tide. I had a blast with my crew and while we did not win, we gained new sailing skills and confidence in racing. With only two of us, it was not possible to take pictures of the race, especially when one needs to keep her hand on the tiller. But I did snap one picture of Mimi's new mainsail as we left the mooring. Sadly I am not able to make the Wednesday night races since I have to work, but will try to make more weekend races. 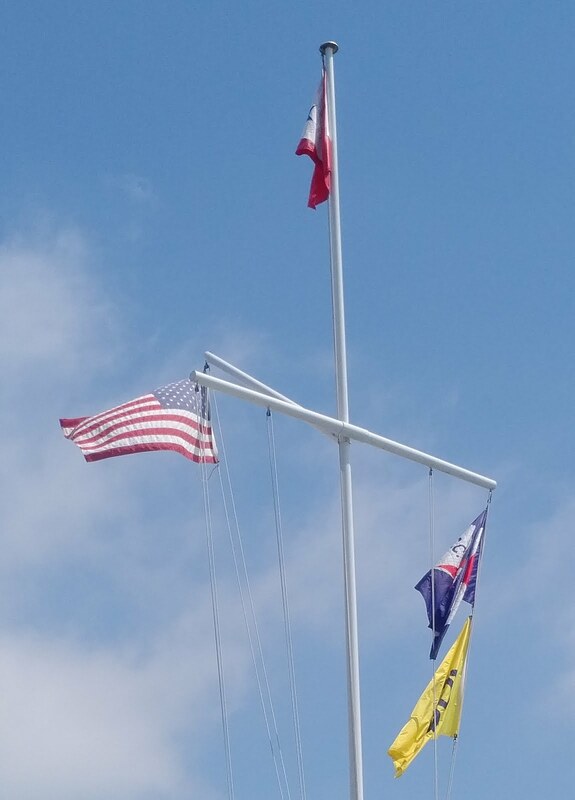 Here is a snap of the club burgee (CPYC) , the USA flag and the Stars and Rhodes 19. The race was official - complete with a barbeque at the finish line! Boston skyline, Logan airport, my girl Mimi to the left of center (the little sailboat) and a family of mallard ducks in the foreground. Many people forget that we Americans were once a colony. Our forefathers declared independence in 1776 and the people living in the Boston area were very instrumental in this movement for freedom. We celebrate this grand event with reflection, baseball, outings with family and friends, cook-outs and my favorite - fireworks. 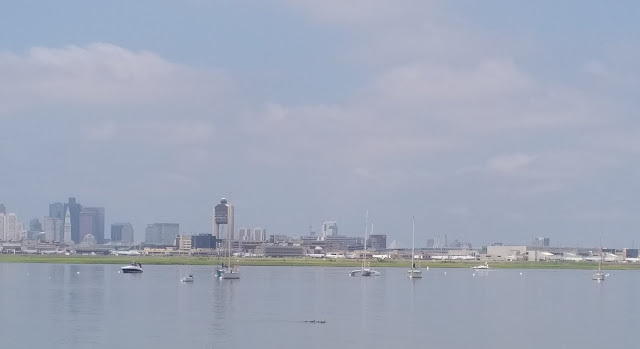 Often I go into Boston to the esplanade or to the boat club to see the display. This year I stayed closer to home and went to Acton to watch them. While not as extensive as the Boston fireworks, they are still beautiful and exciting. And no challenges with parking! Here are a few clips and photos of the fireworks - July 4, 2018! Always a good finale with lots of color, lights and thunder! Summer has hit us hard with temperatures in the 90's. But the gardens look beautiful. thanks to a lot of rain last week. Fionnegan, Gunnarr and Shorty are enjoying the new space to run and play and they are getting a lot of exercise - providing I am outside with them. So I do yard work while they chase birds and squirrels and froggies. The gardens are also a nice place to relax after work and try to read a book for a little while. Here are a few pictures of the flowers in bloom. A gentle, delicate, pale pink rose. Planted along the fence hoping that it will not only survive but climb along the fence as a backdrop. The buds just started to open. These are the first of what I hope will be many flowers. These flowers transferred themselves from another garden, but are welcome wanderers! The lilies are starting the summer blooms. My one vegetable - tomatoes. Soon they will ripen. The dogs have been relatively good and not trampled the plants. Fionn likes to sit under the lavender while Shorty and Gunnarr sit on the boulder. A little more color for the gardens. And my boys outside, enjoying the summer morning. Dirty paws, dirty noses, must stay outside and dry-off and clean up!